One of the most important issues facing the scientific community today is the energy crisis. Most of the energy produced worldwide is generated by burning fossil fuels. In the United States, over 50% of the electricity is produced by burning coal to turn steam turbines. One way to reduce CO2 emissions from fossil-energy (FE) power plants is to increase the thermal efficiency of steam turbines. Ultra-supercritical steam turbines will require an increase of the steam temperature from 900 K to1,033 K and an increase of the steam pressure to 35 MPa by the year 2020. A critical issue is the limited creep properties of current ferritic steels at the targeted elevated temperatures. The objective of our project is to develop more creep resistant ferritic alloy that can operate at higher temperature. This increase in efficiency could lead to billions of dollars saved annually as well as a drastic decrease in CO2 emissions. In the past, Ni-based superalloys have been used in turbine blades for FE plants because of their ability to maintain their excellent mechanical properties at high temperatures. Face-centered-cubic (fcc) nickel-based ?/?` superalloys owe their excellent creep strength to the presence of a high volume fraction of coherent-coplanar ordered ?` precipitates. For the bcc-Fe matrix, ordered B2 NiAl-type ß` precipitates form in a coherent-coplanar orientation, which provides the possibility of achieving a Fe-based analogue to the Ni-based superalloy. 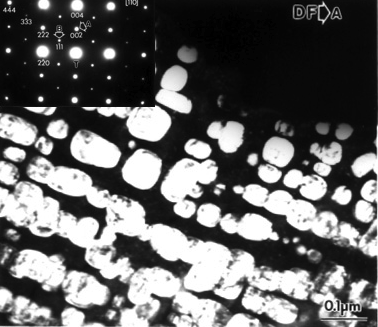 The ferritic alloys that we are studying have a hierarchical microstructure of both B2 and L21 phase precipitates. These are responsible for the added creep strength over existing Fe-based alloys. Using a computational model, we map the motion of a dislocation through different configurations of the microstructure in the material to obtain the desire creep resistance. The model is then confirmed through a variety of experimental techniques.